The return of Marvel Knights with none other than Donny Cates behind the wheel. You know, I’ve loved what the guy’s been doing with Marvel for a while, but he’s even on Guardians of the Galaxy now. I can’t help a part of me being afraid that he gets spread too thin or the editors never telling him not to do something. Lucky for us, that day has not yet come. 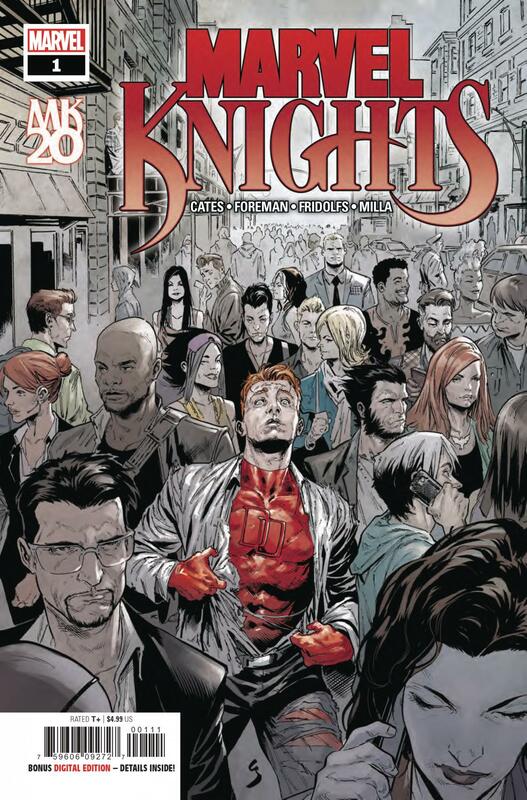 Marvel Knights 20th #1 is an amnesia story, like it or not. Normally I don’t care for them, but the apparent results of whatever caused the selective memory loss at least give us some interesting role changes. It’s not enough to make it an exception if you’re someone who flat out hates these kinds of stories, though. Not yet. The issue sprinkles just enough hints at what’s going on to make me interested enough to check out the next issue at the end, but the rest is pretty vague. Your enjoyment of the issue depends entirely on whether or not that will annoy you. Cates writes all the characters well, but there’s not much lasting when it comes to their interactions with one another since Daredevil is kind of all over the place physically. Also worth mentioning is the amnesia itself. Like I said, it’s selective. On an awesome splash page featuring some pivotal moments in Daredevil history, Matt says he remembers everything, but he clearly doesn’t know any of the other heroes. Where does it start and where does it end? I’m very confident that future issues will explain this, but I could understand if someone said it felt inconsistent. Time will tell. The art has its moments, but the flip side of that is that it too can feel inconsistent. Travel Foreman and Derek Fridolfs have some great close up shots with a lot of detail that still don’t feel too busy. They also have some medium shots that feel like they’re a little too empty. Matt Milla’s colors can change rather abruptly. In some instances, I thought it made the panel look almost like a painting. In others, it felt like there were steps missing. My favorite parts are when a certain ghost(?) appears and their hands seem to glow. It drives home the symbolism of hope and guidance, making the moment much more impactful than it would have been if their hands were boring like mine.